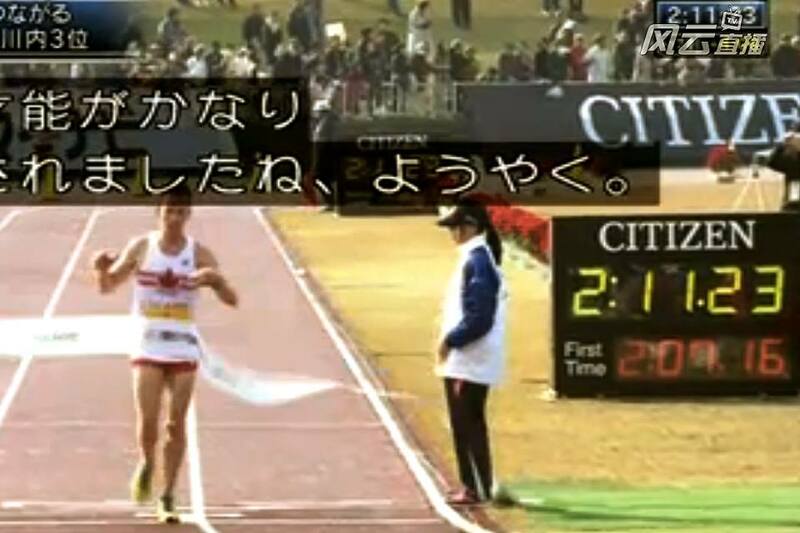 First off I’m happy with 6th place at the Fukuoka marathon. Also, I have no regrets going with the lead pack even if it wasn’t the best move (in hindsight). I better say those things off the bat because the rest of this post might not have the same tone. I think I just ran 2:11:23 (saw the official result, 2:11:24). What I can’t comprehend right now is that my training and preparation this time was much, much better than ever. When I was warming up I was very confident in my condition and I don’t think I was over-confident because I knew I was going to have to work really hard and was prepared to do so. As we warmed up the rain stopped and I thought, this is it, this is the day. I decided to go with the leaders as they were planning on 3:01/km and I was planning on 3:04/km. I figured that 3:01 with a group is easier than 3:04 solo. In fact, I know it is. The problem was a lot of my km splits were 2:59. After 15km a lead group separated and I found myself running with Fujiwara (2:07 pb), Lamdassen (2:09 pb) and some other guy. It made sense to peel off with these guys as I was tired of seeing 2:59’s every once in a while. This seemed to be a reasonable group to run with. However this pack slowed down a ton and after a 3:08 and 3:10 I left those guys behind me and got back into a 3:04 rhythm. From about 18km I ran solo until the very end picking off 4 runners, who didn’t give up a fight. I hit halfway in 1:04:11. At 25km I was still well on Canadian record pace. When I got to the 25.8km bottle table my bottle wasn’t first on the table as it had been on all the others and I grabbed the wrong bottle and tossed it immediately. I took some of the generic sports drink right after but didn’t take too much in case it didn’t agree. Missing one bottle is not the end of the world. After that I was dialled in on Matsumiya who was in 7th. I came to the 180 turn around, naturally slowed down a bit and found I was now fighting an annoying headwind. I had Matsumiya in my cross hairs and all of a sudden I saw my bottle to the left, made a sharp turn went to grab it but it slipped out of my hands. I stopped, turned around (I heard the crowd gasp) and decided to run on without it because I would have had to go back. This time I had to take in at least 150ml of the generic drink. That 5km split was slow (15:51) but with the 180 turn-around and the complete stop I figured I could get it back to 15:30’s. I was wrong, very, very wrong. After 35km it got really tough and I was losing it a little mentally. A voice in my head kept saying that the record had slipped, it was gone, you’re done. And then I would tell myself that I could still get to 40k in 2:03 and be in the running for it. There were times when my pace got really slow and then I would pick it up. But those efforts didn’t last that long. I hit 40km in 2:03:58 and was now focused on a PB. But I was suffering, bad. I passed a Kenyan around 41km and I found myself passing him with gusto and feeling pretty good. I thought to myself at that point that there is more in me but I couldn’t access it alone. 20 seconds later I knew I had buried him and settled back into a slow pace. With 400 to go on the track I looked at my watch and saw 2:10:00. I knew I wasn’t going to run a 55 second lap for a PB and cruised it in. I was deflated. Other than asking myself “what the hell just happened?” I was at a loss for words. It scares me a little that my preperation could good so well and I still didn’t have it. I’ve gone out faster than today through halfway (63:58) and held on better (2:10:55). I held on better in Toronto because I was running with guys until 37km or so. That is where I can make improvement, with better pacing and running in a pack longer. I guess my training, theoretically, could improve too. good honest try at the record! 2:11:23, eh? Nice. The Olympic A standard was 2:11.29?..I think after your spill, surgery/rehab, this was a great comeback marathon! Top 10 in a Gold Label Race. Hell Yeah!! Have fun recovering and looking for your next one! Outstanding Reid, after all you’ve been through. The great build-up will be there for you down the road. Sounds like you left everything out there, what more can one ask? We loved watching you race via the internet – there were lots of cheers coming from the Coolsaet condo in Trenton, MI. Good show, safe travels. Some race there Reid! Impressed and stoked all the way! Nice race Reid. Tough when it doesn’t turn out quite the way one hopes. Good luck on the next go round! The good thing about you not getting CR is that I will continue to stick to your blog which I would maybe have drop if the chase was finally over :-p (Btw Ison comet died during its perihilion and we might heads into its debris and get a spectacular meteor shower at the end of the month…. just saying). Excellent tried. Great job Reid. I’m a friend of Eric Gillis’s from St. FX cross- country. My sister Sarah and I have been following you guys! With the marathon, you just never know. Part of the spirit of it. We’ll be watching you both in the future nail it! Nice job Reid. Here is the race from 19k onwards. You come across the line at about 1h6mins into the vid. Congratulations Reid. Very impressive race! Enjoy the rest of your trip, and safe travels home. Love the running jersey! dust it off next time, it’ll come. Congrats on a great race. Great job Reid. Never before has there been so much interest in such a talented group of Canadian marathoners. We supporters all know that one day soon the CR will fall into one of your capable hands. Amazing run, just like Toronto was. Running with the front pack is not the easy way to do it, especially with both times a full stop! It will pay for sure once you’ll be fast enough to hold on to those paces and you’ve taken enough shots at it. Then you’ll have even pacing. Seems like you’ve had some fun racing again too! Way to go Reid! The record will happen for you soon enough. Looking forward to that day… maybe on home soil? Best wishes for a strong 2014.